Below is a list of events in the Solent area this Autumn and advance notice of events already planned for 2019. 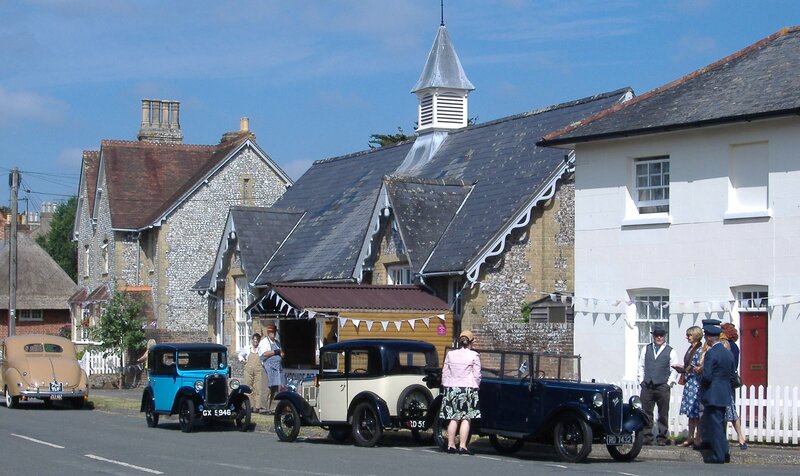 Southwick Village D-Day Revival 2019. 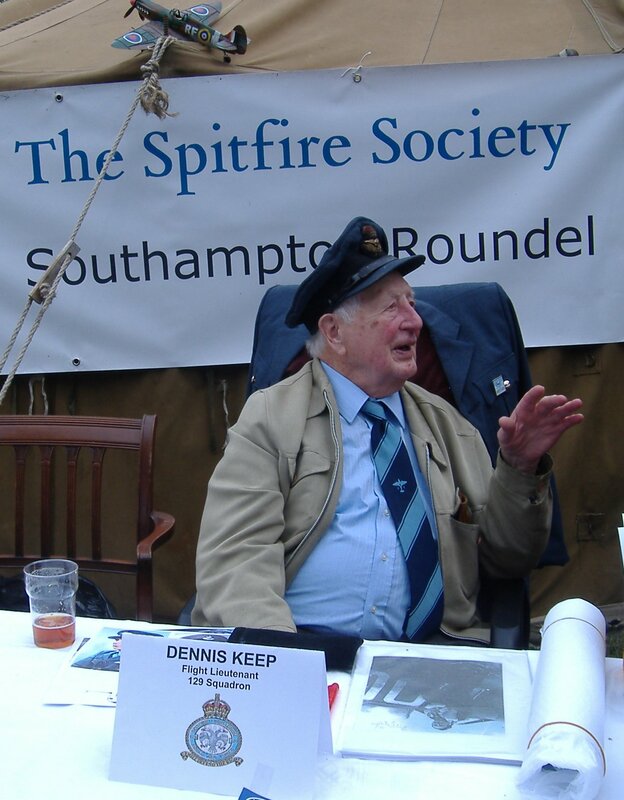 D-Day veteran Spitfire pilot Flt-Lieutenant Dennis Keep telling his story at Southwick Revival 2018. Copyright Anne Grant. Southwick nestles in the valley below Portsdown Hill. In 1944 Southwick House became the base for Admiral Ramsay, General Eisenhower and General Montgomery to plan Operation Overlord. The programme for D-Day 2019 has yet to be announced but if the 2018 event was anything to go by the public should be in for a treat. 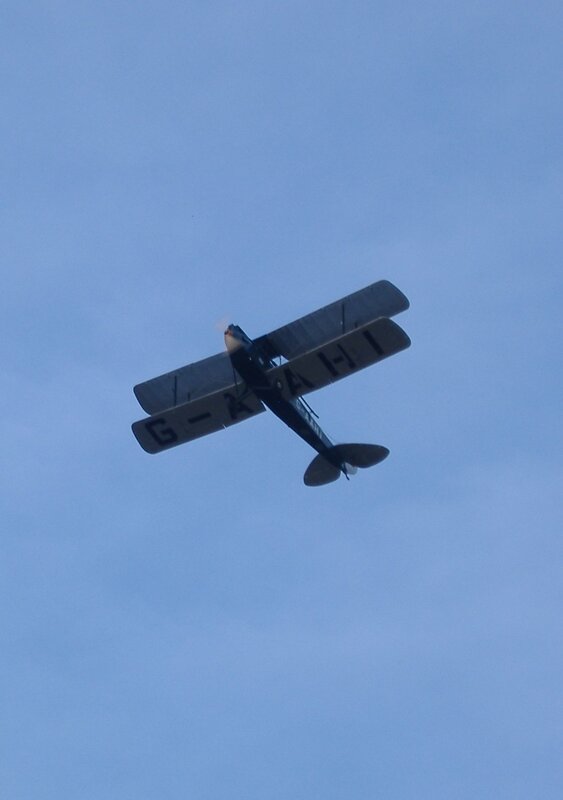 The 2018 weekend saw the Tiger Moth 9 Display Team thrill the crowd with a show of aerobatics. Sunday it was the turn of the Spitfire Flypast (Battle of Britain Memorial Flight). The D-Day Map Room Tours departed and returned from Southwick House. This annual Revival event is a regular sell-out. There were guest speakers and a Dinner and Dance. Digging For Victory and Nursing Us Through, re-enactment volunteers who served up tea and sandwiches in exchange for Ration Coupons. Copyright Anne Grant. The parade of vintage and military vehicles was a big attraction, including the arrival of the ‘US Army’ in their jeeps, that brought ‘Eisenhower’ to the village, ready to meet with ‘General Montgomery’ and ‘Admiral Ramsay’. 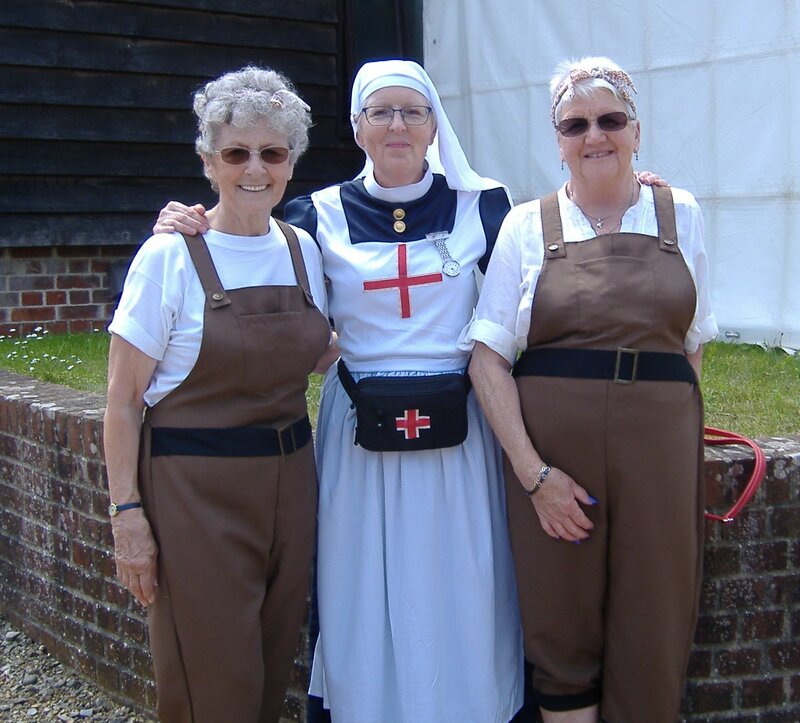 Military and civilian re-enactment groups played their part and added to the atmosphere, from the ‘Street Market Vendors’ to ‘Make Do and Mend’, from the ‘Dig for Victory girls’ to the ‘Red Cross nurses’. Most important of all was the attendance of some of the few surviving D-Day pilots who retold their story to all age groups. Veterans like Flight Lieutenant Dennis Keep of 129 Squadron, guest of the Spitfire Society, eager to share his Spitfire flying experiences with wide-eyed children and adults alike. It is disappointing that the British Government has turned down Portsmouth’s request for funding to put stage ‘D-Day 75’ in June 2019. It is expected to be the last time the historic date in Britain’s history will be commemorated on such a large scale, due to the sad fact that there are so few veterans still alive. Vintage cars at Southwick D-Day Revival 2018, Copyright Anne Grant. But no doubt the organisers of the Southwick Revival will not be beaten by this lack of Ministerial financial support for Portsmouth. Dimbola Lodge in Freshwater, Isle of Wight, are staging an exhibition of Aerial Photography by Alfred Buckham. The exhibition is on from 5 October to 16 December. 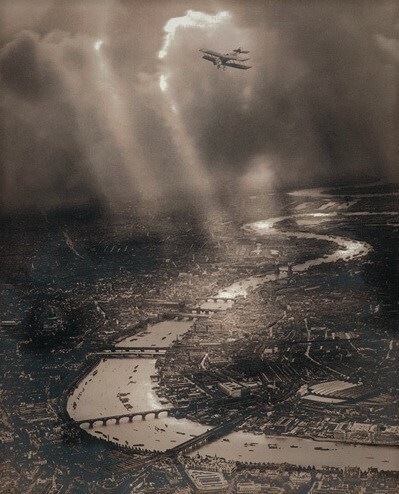 The images were taken during the pioneering years of aviation in Britain and pioneering era of photography. Buckham used a heavy plate glass camera while hanging out of an aeroplane. The photographs date from 1908 to the 1930s. Alfred Buckham was a genius of photography. He created pictures of atmospheric beauty which captured drama amid natural landscapes and seascapes. His images of tiny bi-planes flying through voluminous cloud formations illustrates the vulnerability of the small aircraft dwarfed by nature. Go to the Dimbola Lodge website for more details. Arun and Chichester (Air) Enthusiasts Society meet once a month at Chichester Park Hotel. with guest speakers. The speaker on 28th January is John Chinner, a Lead Avionics Engineer at Airbus Defence and Space, who will talk on ‘The British Space Race.’ All welcome to attend : £3 members, £5 non-members, under 16s are free. Go to the AirAces website for full details and for more full programme of speakers in coming months. Or call David Batcock on 01243 823007. Wight Aviation Heritage Tours in 2019. Two tours have been run so far and each has made a significant contribution to Britten-Norman Aircraft Preservation Society (BNAPS) funds. Further tours will be run in 2019 at the end of March, April, May June, September and October, subject to demand. The tour offers a full day out which covers all travel from Southsea Hovertravel terminal and transport by mini bus on the Isle of Wight to aviation heritage locations at East Cowes, Sandown, Bembridge and Ryde. Also included are entry fees where applicable and a light lunch at the Propeller Inn, Bembridge. Tour is price is £75.00. Please contact bob@bnaps.org.uk for full details. Solent Aviation Art Society meet on second Wednesday each month at the Community Room, Tesco, Quay Street, Fareham PO16 0LE. “We are a friendly group with an interest in aviation art. We go to various venues around the South of England, where members draw, sketch or paint subjects of their choice. We also have exhibitions and competitions. All abilities welcome. New Book ‘Black and Wight Fireworks: British Peroxide Rockets’ by Isle of Wight author Derek Mack. Derek worked on the Saunders Roe Black Knight and Black Arrow rocket programmes. His fifteen years working at High Down, overlooking The Needles, Isle of Wight and then at Woomera, Australia is told in this biography. See also the Wight Aviation Tours item above. A replica of the Black Arrow has been built by apprentices at East Cowes and was delivered to Sandown Airport in July 2018. 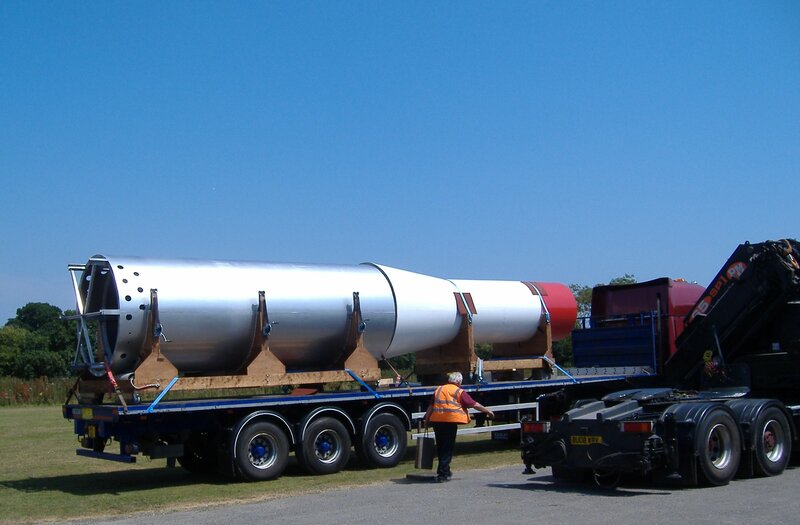 The red cone will be completed soon and that too will be transported to the Wight Aviation Museum hangar to complete the assembly of the rocket. See also Nancy’s Rocket Scientist on this website to read about the brains behind the programme. Paul Leyton had a brilliance from invention and not only rockets. He married Isle of Wight pilot Nancy Crinage. Read more about him on Nancy’s page.